Will AM And FM Radio Really Be Eliminated On New Cars? The conventional wisdom is that kids these days don't dig the AM and FM radio as much as their parents and grandparents did. They're too busy listening to tunes on their smartphones or even on satellite radio. 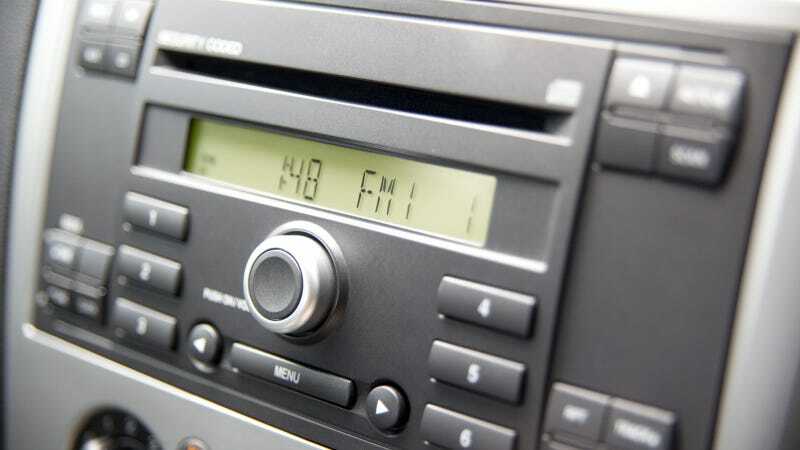 But does that mean that we could see an end to FM and AM radio being offered on new cars in the next five years? "AM and FM are being eliminated from the dash of two car companies within two years and will be eliminated from the dash of all cars within five years." Gulp. Really? Did someone really just say that? Emphasis mine up there. Count me surprised as well. Like I said, conventional wisdom says that the increased variety of sources for music and news in cars (many of which are superior to traditional radio) can totally be recognized as a threat to AM and FM. But within five years? That sounds awfully fast. Probing further, Rhoads finds that GM doesn't believe young people listen to traditional radio, but he wasn't able to determine which two car companies won't have in-dash radio anymore. He wonders what kind of research the car companies are going on to come up with this philosophy. I'd love to know who the panelists were that made these claims, and who these car companies are that will supposedly be dropping radio. However, even he seems to recognize that this really happening, and that the radio industry has to adapt to it. If AM and FM were going away, how much would they be missed? Ninety percent of the time, I listen to iTunes or Spotify when I'm in the car. FM radio these days is a graveyard of mostly awful rock, pop and hip-hop that sounds the same in every city. AM is really only good for listening to sports when you're driving or if you're an old person who loves hyper-partisan talk radio. But not having those options on new cars within just a couple years? Even if I don't use traditional radio all that much these days, I'm not sure I'm ready to give it up entirely on new cars. What say you guys? Will you miss AM and FM radio, or has its time passed? UPDATE: It turns out GM actually responded to that editorial. Perhaps trying to mitigate the freakouts it caused, they say that radio is sticking around in cars. We can’t speak for other automakers, but to be clear, GM has no near term plans to eliminate AM and FM from GM vehicles. We are committed to providing consumers innovative services that dramatically enhance the driving and riding experience. We expect AM/FM radio to be one of the choices consumers have in our vehicles. Interesting. But Rhoads' piece does make you start to think that one day, FM/AM-less cars are a possibility. Hat tip to valvashon and commenter brianshayne!